**Every case is unique; Past results are not an indicator of future performance. 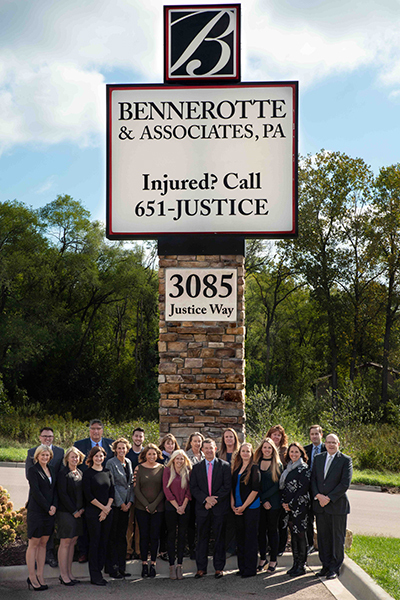 Bennerotte & Associates, P.A., has successfully represented hundreds of injury victims or the families of those injured or killed by the negligence of others. The success stories below are but a few examples of the results we have achieved for our clients. Wrongful death settlement obtained in a premises liability case. For the wrongful death of 60-plus-year-old female who was not properly administered antibiotics for treatment of kidney infection. Recovery from injuries suffered from an auto accident with a dump truck. We obtained a $1,300,000 settlement for a victim in a DWI auto accident. Auto accident involving spinal fusion surgery. For a minor child who was sexually abused by another patient while admitted to a psychiatric center. In a labor and delivery case where the baby suffered brain damage during delivery due to the failure to timely diagnose and treat a uterine rupture. Trial verdict for PTSD following a car accident. Violation of civil rights - Wrongful death recovery for woman who was denied adequate medical care at Jail in North Dakota. Settlement for wrist injury caused in low impact collision. For a car crash victim who suffered from temporomandibular joint dysfunction, commonly referred to as "TMJ," following the crash. The insurance company's offer prior to trial was $1,000. For the wrongful death of a 73-year-old man who passed away after delayed diagnosis of coronary artery disease. For a 26-year-old female for injuries suffered as the result of delayed diagnosis and treatment of a deep venous thrombosis. For a minor child who experienced a delay in diagnosis and treatment of developmental dysplasia of the hip, resulting in numerous surgeries and permanent injury. For the wrongful death of a 38-year-old man who was negligently administered narcotic medication in an intoxicated state and was not properly monitored after the medication administration. For the wrongful death of a 56-year-old man who was not properly monitored in a psychiatric facility and committed suicide. For the wrongful death of a 38-year-old man who died as a result of the failure to timely diagnose and treat cardiac disease. For a 47-year-old quadriplegic female who suffered a distal femur fracture and dislocated left knee as a result of being dropped by nursing assistants at a nursing home during a routine Hoyer Lift transfer. For a 36-year-old female who suffered a permanent brain injury following a cesarean section delivery. For the wrongful death of a 26-year-old female following childbirth. For a 37-year-old female who suffered deformity and diminished function in her non-dominant hand after receiving negligent treatment for a laceration. For the wrongful death of a 41-year-old female who died secondary to failure to timely diagnose and treat cardiac disease. For the wrongful death of a 35-year-old man who died as a result of the failure to timely diagnose and treat cardiac symptoms. For a young woman who suffered a patella subluxation as a result of injuries sustained in a car crash.